Once upon a time, nearly two years ago, I reviewed a math program I dearly loved. My conclusion at the time was that Math Mammoth was going to become the spine of my elementary math curriculum. Reality turned out quite different. That year, we reviewed SO many math programs, and kept having to set Math Mammoth aside, and eventually we just stopped picking it back up. And what happened is that my elementary-aged math students did start to master math facts... but most are missing some other basics. And I started this school year completely stressed about what to do with math. So finding out I'd be reviewing Math Mammoth again this year was a gift from God. The idea with the program is that the student is completing 1-2 pages a day (closer to one for first grade, closer to two for 6th) to work through the book in a school year. Richard, doing the 2nd grade program, is working at more of a page a day pace, with the occasional session including two pages. Trina, my kindergartner, is sort of doing the 1st grade level. She is doing a page or two per week and we are doing a lot more playing with the other resources provided. The pages contain a bit of explanation, but aren't cluttered. The color coding helps me to know which parts I *should* be working through with the kids, and which they are intended to work through on their own. But I can work with them if I want to, or make them work on their own if I need to. Each chapter includes introductory material for the teacher, including a brief description of what is to be covered, a mini table of contents, and links to additional resources on the internet. I love that I don't have to use the extras when my kids are getting it. I love that the extras are available to the kids who need it. So far, for all my kids, there has been just enough problems to make the work understood. I love the scope and sequence. It doesn't try to cram every math concept into every year. But it does introduce a concept (like multiplication) one year, then actually work on it the following year, and master it in the next. Brilliant. The price -- $34 for a full-year set -- is very reasonable, especially since you can purchase it once and use it for all your kids. My kids' opinions? They are really appreciating (well, mostly!) that we are working through math systematically. They definitely appreciate that they don't have to do dozens and dozens of problems in the process. They feel they do enough to 'get it' and aren't stuck doing busy-work much beyond that. William said, "This is the best math program I've used." What I really, truly love is that William and Thomas are back to feeling at least competent about math. They had lost that feeling. Okay, so now let's chat about Connor and the Make It Real Learning book we used. He absolutely loves the concept here... each book ($4.99) contains 10 sets of problems. 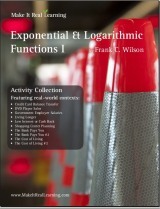 The Exponential & Logarithmic Functions title that we received includes problems relating to credit card balance transfers, cost of living, compound interest, etc. All of the problems are real-life ones. Do you transfer your credit card balance to one of those 0% interest for 15 months offers, or do you stick with the card you have? Which car promotion is better -- the one giving you 0% financing or the one giving you cash back? Connor loves that aspect of these books. It is real stuff. However... we aren't quite to exponential and logarithmic functions in his Algebra II course... and, ummm, I don't remember this stuff. These books really work GREAT if they are used to reinforce the "when am I ever going to need this?" aspects of concepts already studied. These books do not work so great when neither the student nor his mother has any idea how the problem is to be solved. The MIRL series has titles that range from arithmetic (grades 3-6) to Calculus, with most of the titles being appropriate for various points in algebra. Having something practical to go with high school math is huge. I absolutely love this series. We will end up owning -- and using -- them all. I said it at the end of my last review, but I am following through this time. My four younger kids are going to start where they are and work through the 6th grade Math Mammoth books. And we will supplement math with MIRL as well. Disclaimer: As part of the TOS Homeschool Review Crew, I did receive some of the Math Mammoth and MIRL titles mentioned above in exchange for my review. All opinions are my own. For more about my take on reviews, visit my blog post here. That MIRL book sounds great. I think "I" need to do that one! Thanks for your post. I am using Singapore for my 2nd & 6th grader & have been pretty happy with it - however I have concerns about it covering enough - as my 6th grader prepares the leap to new math. I've looked at different programs & I'm not sure it covered enough of some topics. Are you still using MM? If so - how are your children doing with this now? I have all of the materials for my daughter (begins 3rd grade this summer) to complete Singapore through 5B, but I'm concerned that it may leave some things out that most other curriculums cover. Math Mammoth is one that I keep looking at trying to decide if it is right for us.